A raspberry fruit is an aggregate fruit. It is made of many drupelets. A stone fruit, also called a drupe, is a fruit with a large "stone" inside. The stone is sometimes called the seed, but that is a mistake, as the seed is inside the stone. The stones can also be called pits. Examples of stone fruits are peaches, nectarines, plums, lychees, mangoes, and cherries. These fruits are edible and used frequently in cooking. As with all fruits, what the ordinary person talks about is often very different from what a botanist understands. Not all drupes have single large stones. Rasberries are a good example. To see their stones, the fruit has to be carefully broken open. Then the tiny stones can be seen inside. 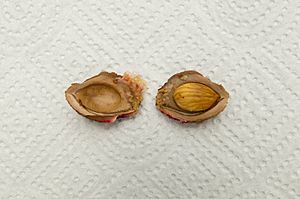 They are called stones because the seeds keep their covering (called an endocarp), not because they are large and hard. 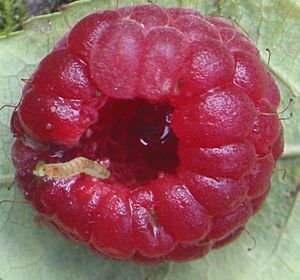 The many small round parts that make up a raspberry each have a similar structure with a very small pit inside. 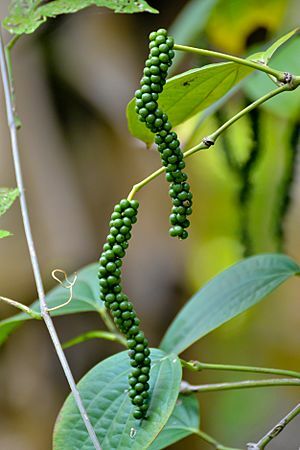 The small parts are called drupelets, meaning little drupes. Stone fruit Facts for Kids. Kiddle Encyclopedia.